Adrenaline addicted? Nature and culture lover? This tour is designed for you! From Leh we'll move to Padum via Kargil, visiting several temples and sightseeings enroute. You'll be amazed in front of the magnificence of glaciers and canyons and you'll get strong adrenaline rushes crossing rapids of grade III and IV. Join this unforgettable adventure tour of 5/6 days to stay in full contact with the nature and to push yourself to a new limit! You can also personalise the package with transport from/to Leh and accomodation or you can connect it to other tours that we provide. 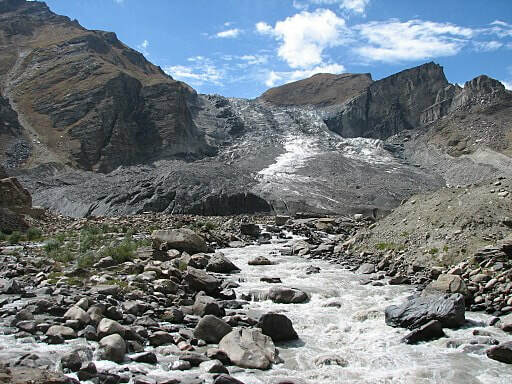 Today we’ll take a spectacular 6 to 8 hour drive past the villages of Panikar and Parkachik, with magnificent views of the 7100 m (23430 feet) Nun and Kun massifs, hanging glaciers, and large meadows. Our destination is Rangdum Gompa (3636m/12,000ft), founded in the early 16th century and currently home to about 40 monks. Rangdum has a small museum with fine artifacts. It is perched picturesquely atop a centrally rising hillock within the arms of a bifurcated mountain stream. We’ll camp nearby. After breakfast we'll drive along the spectacular road to Padum, enjoying its wonderful panorama. We'll arrive for lunch and in the afternoon we'll set up the camp for the overnight stay. A layover day at this perfect campsite for a well deserved rest. There are optional hikes to Kaya and Skiu villages. In the afternoon twenty-five kilometers of thrilling Class III rapids brings us to the confluence of the Indus and Zanskar Rivers at Nimmoo. You'll be welcome to stay overnight at Dolma Retreat Center in Nimoo with Local food and ladakhi system.